Heat the oil in the way you like them, fry the seitan for a couple of minutes, if necessary wipe it on a paper towel and dip it in the sauces, already arranged in bowls. 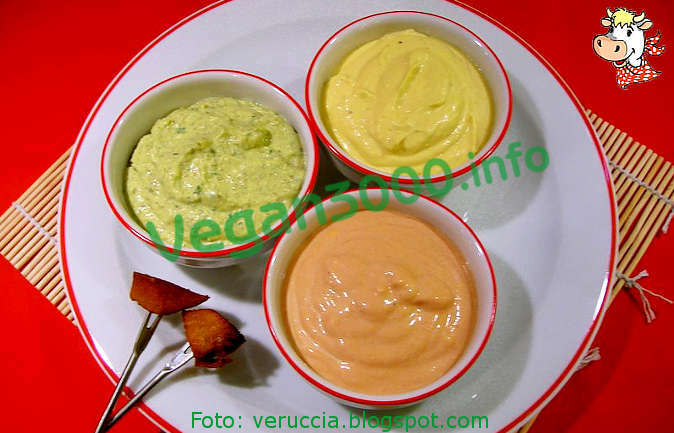 Pictured: two pieces of seitan nicely golden, and clockwise Béarnaise sauce (yellow), salsa rosa (Pink), tartar sauce (green). Pour the soy milk into the blender, simply run and add, flush, all corn oil, salt to taste, lemon juice, vinegar and turmeric. After preparing the remaining mayonnaise sauces, served as an accompaniment. Chop parsley, gherkins and capers, and mix all the ingredients with a spoon. Mix thoroughly all ingredients with a spoon. In Valentine's Menu the seitan fondue bourguignonne is to some extent more "important": not only is it delicious, but it's so much atmosphere. This is cook the seitan, cut into bite-sized pieces and skewered with special forks, in hot oil until it becomes golden and crisp; then it dips in one of the sauces served as accompaniment and you eat licking their chops. It's kind of a fascinating game, provided of course not to set fire to the tablecloth! Proceeding with the order: you can use olive oil, but it would be better to choose one less tasty, like peanut or grapeseed, if you find it. You can spice it with an herb (such as rosemary or sage) to leave it for a few hours; the oil must be filtered before use. At this point the gas warms; when it's hot moves on the fondue burner. And if you don't have it? You can fry normally using the gas, but don't keep the flame to the max, and add a piece of potato to prevent the oil get warm too and splashing everywhere. Or you can use a hot plate carrier on the table, but only if you know that you do not set fire to the room! The dilemma, if you are not a fondue set and choose the gas, is: cook all the pieces and then sit down at the table as educated persons, or fry a few at a time, continuously orbiting in the kitchen area? In my opinion it depends on the situation and the amount of seitan, if you don't do it too I recommend frying it all in one go: it's so good that you'll love certain become cold. The seitan should be soft but compact; the ideal is autoprodurlo, because you'll have to cut it into pieces not too small. If you buy it, so choose it in chunks. You can prepare it the day before and store it in the refrigerator already cut into squares (not too regular) of about 1 cm or so; not least because, immersion, the fried seitan narrows. Even the sauces can be prepared in advance. The idea was inspired by La Cucina Etica - Vegan3000, but I changed some of the sauces. Given the circumstances, it is better to accompany the dish with a simple, fresh and light salad.